Dhaka, 15 Jan, Abnews: Prime Minister Sheikh Hasina yesterday sought more Canadian investment for mutual benefits of the two countries. "We need more investment for rapid economic development and we're setting up 100 special economic zones in the country with various facilities to attract more investment and generate employment," she said. In this connection, the prime minister mentioned that her government wants to facilitate the investors. "So we urge the Canadian investors to invest in Bangladesh in a large scale," she said. The premier made the remarks when newly-appointed Canadian High Commissioner to Bangladesh Benoit Prefontaine paid a courtesy call on her at her Jatiya Sangsad office here last evening. While talking about the next general election, Sheikh Hasina said her government wants country's democracy to continue smoothly. In this regard, she mentioned the introduction of transparent ballot box and preparing a flawless voter list with photographs. About Rohingya issue, the prime minister said Bangladesh has given shelter to over 10 lakh forcibly evicted Myanmar nationals on humanitarian grounds. 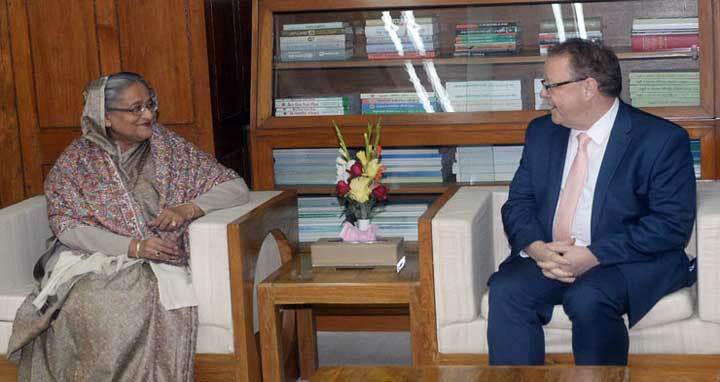 In reply, the Canadian high commissioner highly lauded the Bangladesh government of Prime Minister Sheikh Hasina for giving shelter to the Rohingya people and extending all out assistance to them. In this connection, the envoy said Canada has already been expressed concern over the exodus of tens of thousands of Rohingya people into Bangladesh. "Our prime minister has sent a special envoy to Myanmar to discuss the Rohingya crisis," he said. The prime minister recalled with profound respect the prompt support of Canada, especially the then Canadian premier Pierre Trudeau, to Bangladesh's Liberation War in 1971. She also remembered with her meetings with the present Canadian premier twice. Sheikh Hasina elaborated her government's stunning successes and achievements in various sectors saying the GDP growth now stood at 7.28 percent, per capita income rose to 1610 dollars and poverty rate reduced to 22 percent. Besides, she said, the government is encouraging parents and guardians to send their children to schools, while money of stipends is being sent to mothers' cell phone accounts directly. Benoit Prefontaine said Canadian foreign minister is likely to visit Bangladesh soon. He said Canada will continue work for further strengthening the bilateral relations between the two countries. "Canada is very optimistic about the potentials of cooperation in various sectors," he said. The high commissioner said Canada welcomed establishing consulate office in the Canadian city of Toronto. He said Canada wants to help Bangladesh promote further women empowerment.